Hello and welcome, here is a sneak peek of what I'm sharing over at Quietfire Creations today! A Note Card project and DIY Background technique awaits. 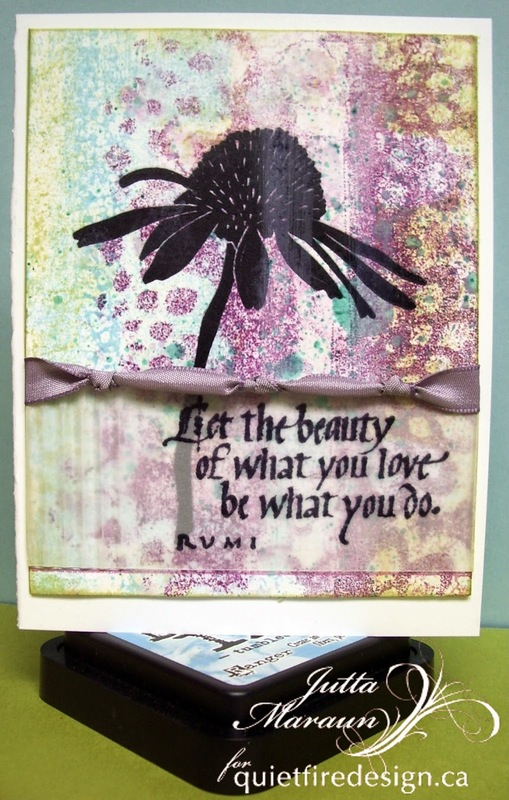 This card has a background that I'm calling the Faux Jelly Printing technique and I think it's the perfect base for the beautiful quote stamp -Let the beauty of what you love from Quietfire Design . For the complete instructions and supply list as well a chance to win an awesome stamp in the Tuesday Winsday give away please visit Quietfire Creations Blog. an informal congratulation card such as this one. Close up to show sparkle. 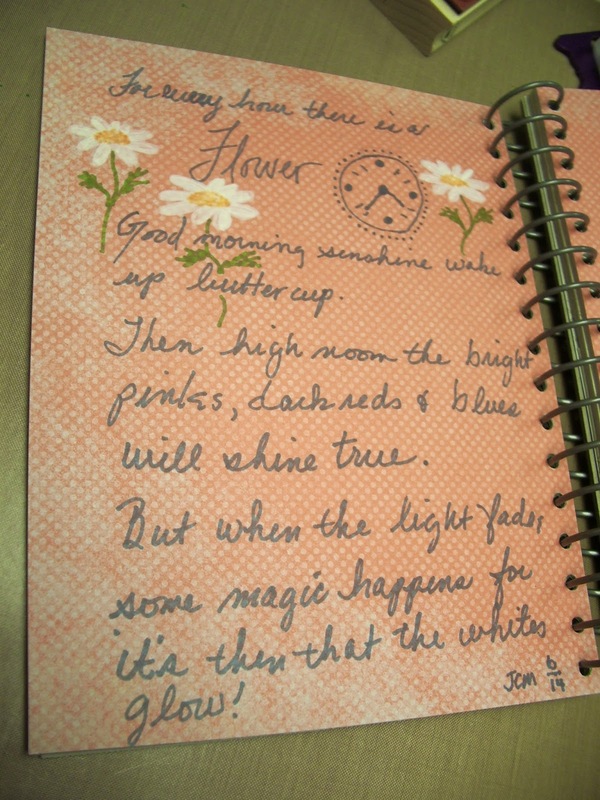 For this card I used a Stampin Up! Strawberry Slush and White Glimmer Cardstock. 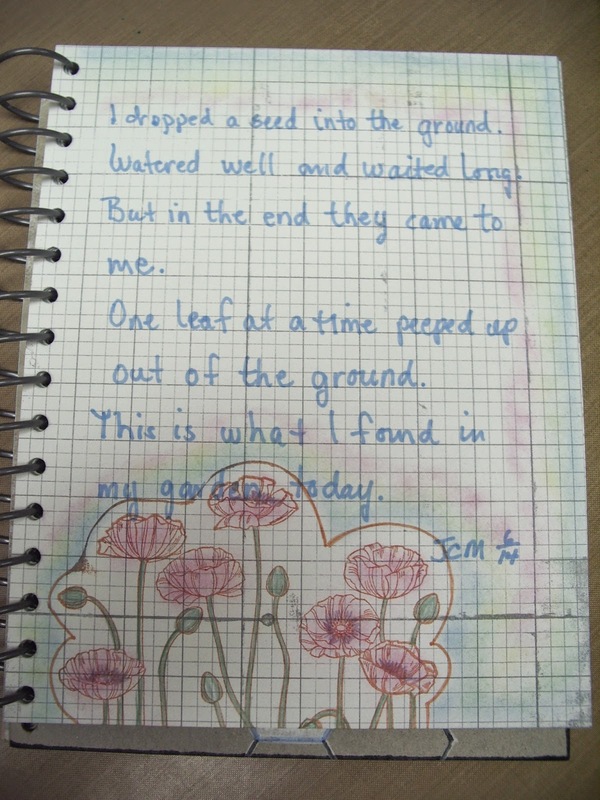 The pattern paper is from Webster's Pages -Sunday Picnic and Everyday Poetry Combo Pack. The ink is Ranger Archival in Jet Black. For sparkle I used the Sakura Clear Glitter Pen. Well that's all for today, thanks for stopping by! Hello, I'm back again with my Tutorial for making a Stamped Collage ATC Album. This time around I've gone with a very organic colour scheme. Start with 1- 8.5”x11” (letter size) sheet of patterned cardstock and 1- 8.5”x11”solid coloured cardstock. Cut solid cardstock to 8.5”x9.25” (or ½” wider than card sleeves). Now cut both pieces of cardstock in half length wise. Piece together so that the extra 1-3/4” on the patterned cardstock is on the right when you look at front and that the pattern is right side up if needed. 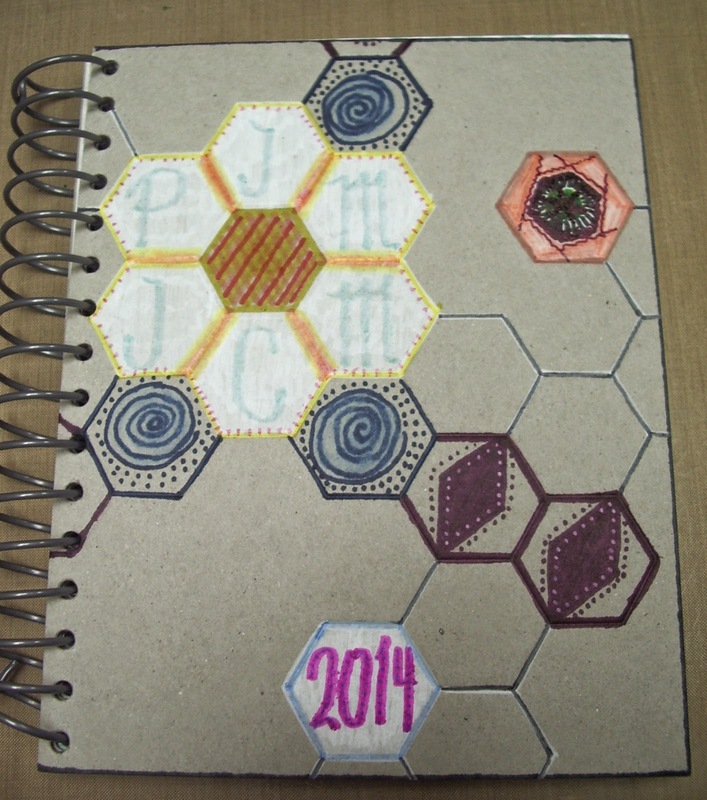 Then adhere together, folding the extra patterned cardstock to the inside. Now do the same for the back when you are looking at it the extra will be to your left. Use corner rounder on opening ends. Set aside to dry if needed. Note: 1 sleeve =3 pages which will hold 3 ATC’s single sided or 6 cards back to back. Punch 2 -¼” holes in covers and sleeves as per photo below. Now that the glue is dry the fun begins. 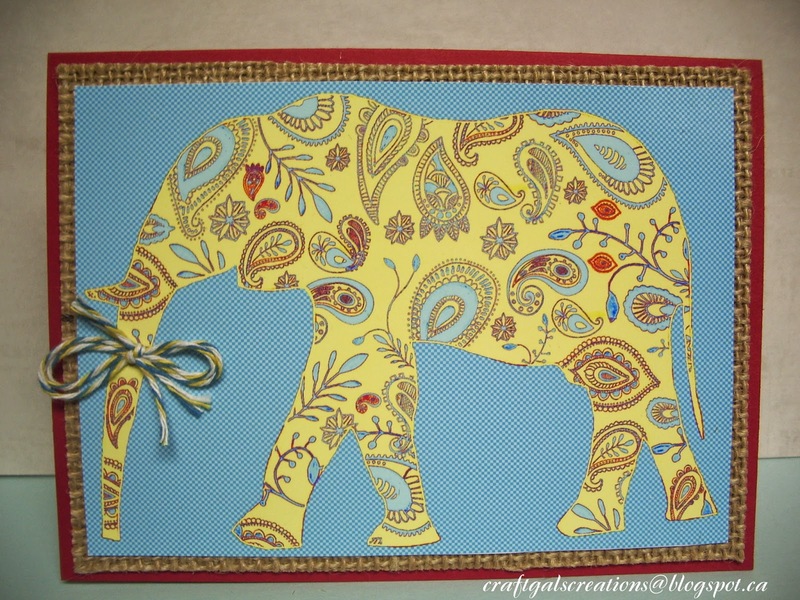 Decorate your patterned cardstock with a stamped collage of your choice. Add stamped ATC to center front of album or chipboard letters look great too. Be sure to sign and date back of album. For my album I started with HA Musical Background stamp. Followed by the HA Fern. Complete collage background with HA Medallion. Tip: to save time and ink line up both covers and stamp as one for partial impressions on each. To assemble add ribbon to hold all together. Here a final photo of completed cover and supplies. 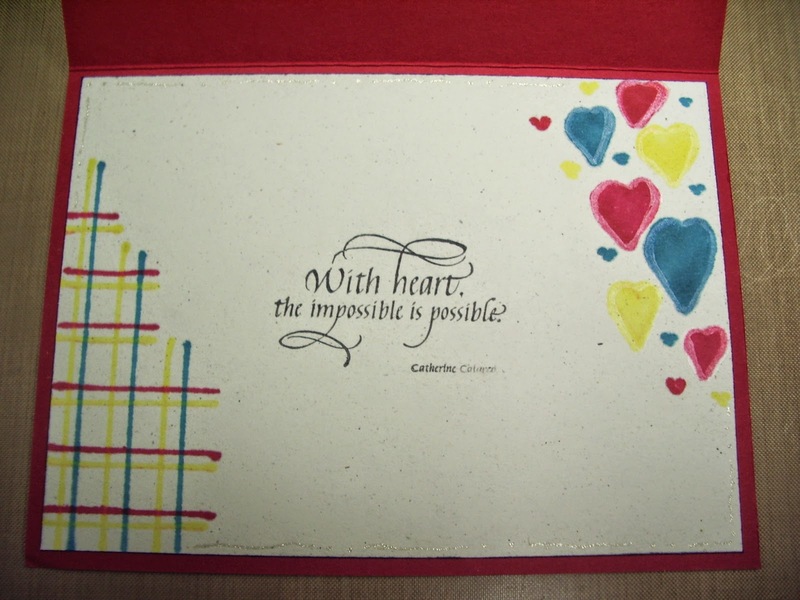 The ATC and Art stamps are from Quietfire Design. Please leave a comment for your chance to win this Album with 3 ATC’s included. One winner will be drawn on June 20th at random from comments left on this blog only. I’d love to see your finished album so please do add a link in the comment section to your creation too! The options to customize your ATC Album are endless, have fun and happy trading!